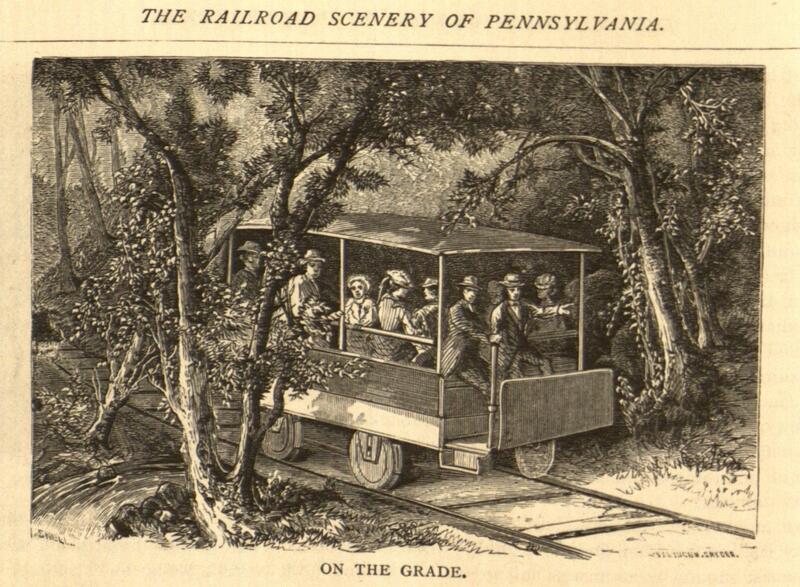 The Pennsylvaniana Collection in the Digital Library is the perfect place to go if you want a detailed look at the life and layout of 19th Century Philadelphia – in particular a very interesting old book entitled “Philadelphia and its Environs, and the Railroad Scenery of Pennsylvania.” This engaging little volume, published in 1875 by J. B. Lippincott and Co., catered richly to my penchant for poring over street maps, and taught me much about Philly’s geographical development over its multi-century history; and beyond the reports of long-gone former features of familiar locations within the original city bounds, throughout the districts consolidated in 1854, and even into the western and northern suburbs, the adventure stretches deep into the Pennsylvania countryside, illustrating the Keystone State’s unique place in the history of American railroads. It’s fairly common knowledge that the famous Dock Street, site of William Penn’s original landing, was a winding creek before unsanitary conditions led the city to level and pave it over, but in this book I learned about several other lesser-known bygone landmarks that imparted names to prominent Center City streets: the creek running east to the Delaware which began at a spring at what is now the corner of 6th and Spring Garden; and the eastern terminus of Arch Street, which sunk into a ravine west of Front Street and was crossed at that junction by an arch. (Front Street, which once outlined a river bluff mandated for preservation by William Penn as a public promenade, of course now overlooks Interstate 95.) And did you know that Race Street used to be called Sassafras, and that South Street used to be Cedar? Intended as a guide for tourists paying a visit to Philadelphia, the book leads the reader to a host of historical landmarks, buildings, and natural features, many of which – Independence Hall and the Betsy Ross House, for example – are still kept alive in memory today as current attractions; but the perspective of 1875 also brings to life many sleeping giants within present-day Philly. 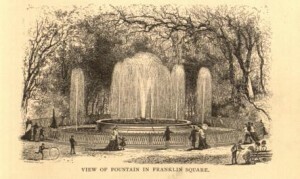 Fairmount Park in particular must have been very beautiful, judging by the detailed descriptions of the parks and monuments at sites like Lemon Hill, and the woodcut illustrations of views from various bluffs above the Schuylkill. This was the eve of the Centennial Exposition, and especially noteworthy is the mention of ongoing construction of the permanent hall, the building that was “saved” in 2008 by the Please Touch Museum. Overall this virtual tour is very thorough; reading this section of the book one gets the sensation of systematically traversing the streets of Philadelphia and experiencing them as they must have appeared in 1875, buildings, parks, railroads and all. 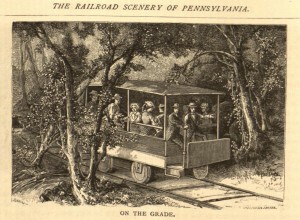 Also very thorough, vivid, and exciting is the tour given in the second half of the book – an imaginary journey through the entirety of Pennsylvania’s unique and wonderful railways. This author takes you on a memorable ride through the dips and turns of the Delaware Water Gap and the Lehigh Valley, up and down the ingenious locomotive-free switchbacks of the “gravity railroad” at Mauch Chunk, and west into the coal country developed by Stephen Girard (namesake of Girard Avenue), where the grades were some of the steepest in the world, and where horseshoe curves existed such that “engineers going over the road with long coal-trains, on dark nights, have been signaled to stop by a red light on the track ahead, which, on investigation, proved to be the customary signal-lamp on the end of their own trains.” These descriptions held a special interest for me, as I had recently heard mention of these very same areas by Engineering professor Dr. Ronald Chadderton in the course of his lecture in Falvey Library on the 1889 Johnstown flood. And of course, roads closer to the source (Philly) are described in detail which illustrates how much of our surroundings in Southeast PA – the “Main Line”, and the riverside route down the Delaware toward Ridley Park and Chester – were already venerated fixtures of the region even as far back as 135 years ago. 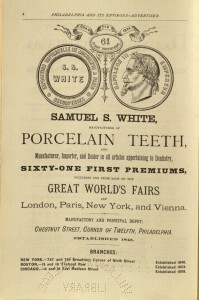 And last but never least, a popular publication of the 19th century is always a great place to browse antique advertisements. 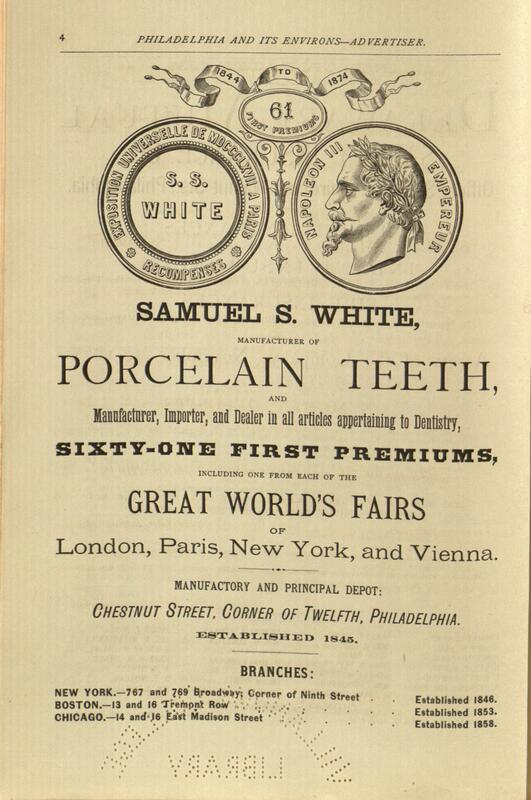 In this volume, look for Samuel S. White’s Porcelain Teeth, Marcy’s Sciopticon (a primitive projector of some kind), W. J. Wilcox’s Lard Refinery, and Atmore’s Mince Meat (source of the cow on the Pennsylvaniana Collection’s banner image). Point your browser to http://digital.library.villanova.edu/Pennsylvaniana/Pennsylvaniana-00001.xml, and go back to 1875 for a fascinating trip around Philadelphia and Its Environs. Nothing like a good old fashioned history lesson. I am very interested in the history of Pennsylvania during the time when the nation was still forming. A lot of this countries roots stem from happenings in Pennsylvania. People say that there is nothing there anymore, but it houses one of the best schools in the entire nation. Nice content. Thank you for sharing nice information with us.